Doubt stays my hand there in the supermarket, balancing on my tiptoes, fingers curled around a can of jumbo pitted black olives. You’re going to regret this, the little voice informs me. I shift my basket in the crook of my arm, rolling back on my heels to read the label on the can. You don’t even like olives. After a particularly stressful day, I find myself where I usually do on the tail end of stressful days – our local grocery store. Having voraciously watched episode after episode of The French Chef over the past week or so, I’ve found one recipe has stuck out in my mind – Julia’s main course on Spaghetti Dinner Flambe: Spaghetti Marco Polo. According to historical distaste for briny and salty, I should be somewhat repulsed by the components of the bright, chopped “sauce” that tops the pasta – nuts, fancy pimento, and a generous portion of chopped black olives. Strangely enough though, I’ve been so fascinated by the unique, tomato-free nature of the dish that I’ve watched the episode three times, ensuring I’ve gotten all the details down pat. But as I stroll the linoleum tiles of the canned foods aisle, I’m having second thoughts. Certainly it would be easier to fix something more familiar, something more to my taste – perhaps a stir fry with peanut sauce, or a South-of-the-border bowl with plenty of cumin and lime juice? No, the other little voice says. Put your faith in Julia. The can of olives finds a place in the basket next to the zucchini. After thoroughly mixing the Marco Polo sauce, I take a tentative bite from the end of the spoon. The harsh brininess I was expecting is nonexistant, replaced by a pleasant creamy saltiness complemented by mild, sweet pimento and bright parsley. Oh Julia, I should never have doubted you. I’ve made a few changes to Julia’s dish in order to meet my needs: while she used chopped walnuts, I happened to have dry roasted sunflower seeds on hand (though I’m sure that any finely chopped nut would do very nicely). 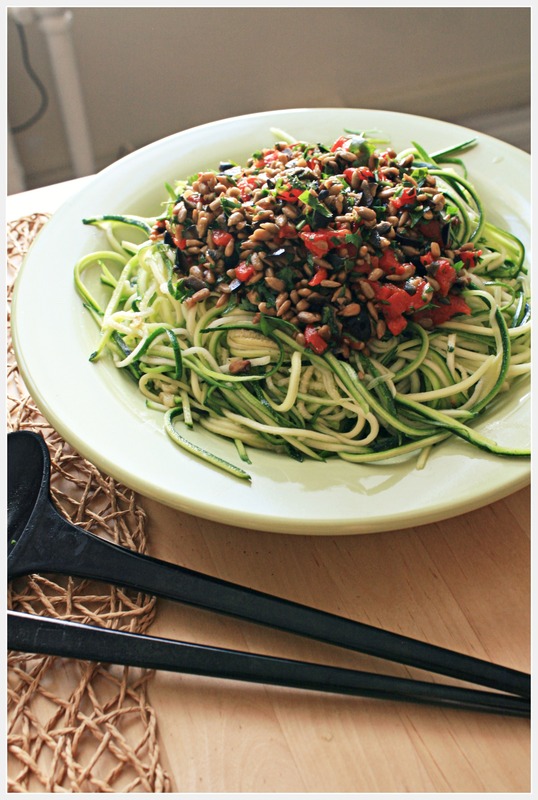 Also, I’ve given the whole thing a slightly modern twist by serving it over my favorite julienned zucchini (“zoodles”) rather than spaghetti. 1. Trim the ends from the zucchinis and julienne them. Place the strands in a large colander and sprinkle well with salt – this will draw out the excess moisture. Let them drain in the sink or over a bowl for 10-20 minutes. 2. 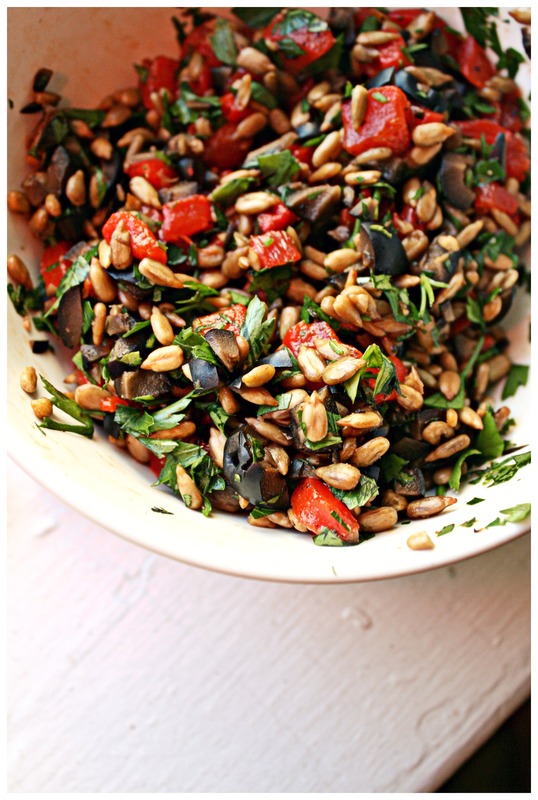 Mix the chopped pimento, black olives, sunflower seeds, and parsley together. Add salt and pepper to taste. 3. Rinse the salt from the zoodles and dry very well. 4. Heat the oil and garlic in a large pan over medium-high heat. Cook your garlic until just about done – you’ll only add the zoodles long enough to heat them through. Add the zoodles to the pan and stir well to coat with the garlic and oil. 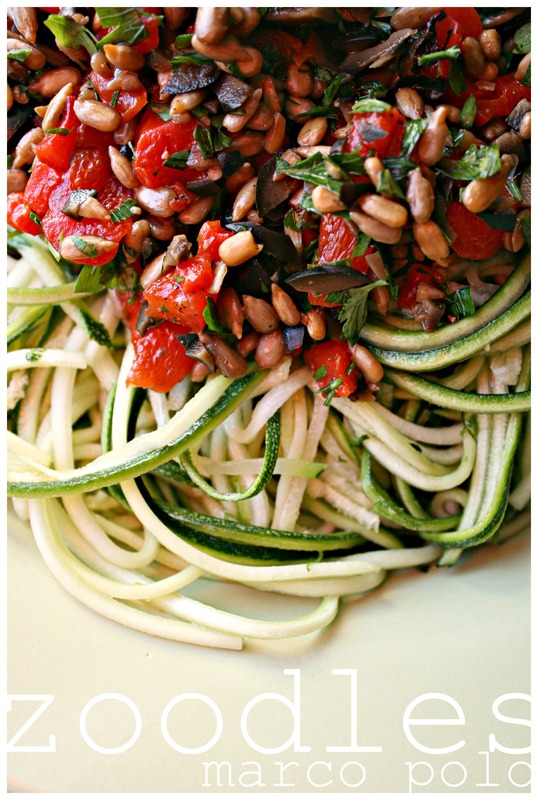 Allow the zoodles to just heat through and transfer them to a large serving platter or bowl. 5. Pour the Marco Polo sauce on top of the zoodles and sprinkle with nutritional yeast, if you like. Serve warm or at room temperature. Nutrition per Serving: 301 calories, 18g carbohydrates, 7g fiber, 21g fat, 9g protein. This entry was posted in Uncategorized and tagged dairy free, dinner, easy, gluten free, Julia Child, low carb, lunch, quick, The French Chef, vegan, vegetarian by Melissa Hartz. Bookmark the permalink.